With over 10 years experience helping customers resolve computer driver problems, and backed by over 2,000,000+ driver database, plus industry-leading driver scan technology, Driver Navigator provide a one-stop driver solution. Auto Detect & Download Audio Driver, Printer Driver, Scanner Driver, Modem Driver, Motherboard Driver, Bluetooth Driver, Ethernet Driver, Wireless Driver, Touch Pad Driver, Keyboard Key, Mouse Driver, USB Driver. Easily! 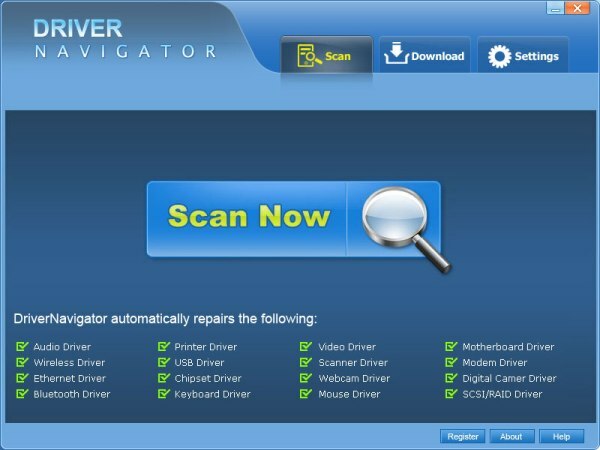 Auto detect device drivers and download drivers with Driver Navigator. * High speed scan detects updates within minutes! With over 10 years experience helping customers resolve computer driver problems, and backed by over 2,000,000+ driver database, plus industry-leading driver scan technology, Driver Navigator is proud to provide you a one-stop driver solution. Driver Navigator - Your best choice for no more old drivers, no more driver troubles & An easier way to Keep you computer at peak performance! Qweas is providing links to Driver Navigator 2011 as a courtesy, and makes no representations regarding Driver Navigator or any other applications or any information related thereto. Any questions, complaints or claims regarding this application Driver Navigator 2011 must be directed to the appropriate software vendor. You may click the publisher link of Driver Navigator on the top of this page to get more details about the vendor.